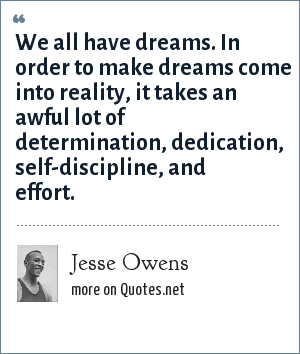 Jesse Owens: We all have dreams. In order to make dreams come into reality, it takes an awful lot of determination, dedication, self-discipline, and effort. "Jesse Owens Quotes." Quotes.net. STANDS4 LLC, 2019. Web. 24 Apr. 2019. <https://www.quotes.net/quote/73944>.